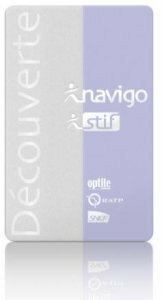 Navigo Decouverte / Navigo Card is a multi-use week pass smart card for Paris Metro trains, RER trains, buses, Transilien trains (but not TGV high speed trains nor other intercity trains). 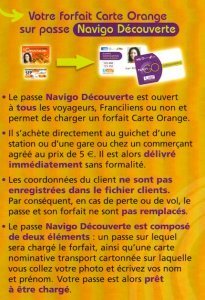 Also available as a Navigo Day Pass card as of January 1, 2018.
and Orly (via RER C & Orlybus only. Navigo is not valid for Orlyval train from Antony station on RER B train line). Monthly Navigo Cards are on sale from the 20th day of the preceding month. For example, if it’s January 20, you can purchase and apply February Navigo Monthly pass validity to your Navigo card and it will be good up through to February 28/29 (depending on leap year, oh why did I choose a month that has varying length for an example). The Paris train, metro, RER, tram and bus system uses a Navigo Découverte smart card for weekly transit passes. These passes are open to visitors (see note) as opposed to normal Navigo passes which are for residents of Paris Ile-de-France only. The Navigo Découverte pass card can be purchased for a fee on top of the regular week pass prices noted above, which is for all zones which covers Paris and surrounding suburbs, airports Roissy-Charles de Gaulle (CDG) and Orly (ORY), Chateau Versailles, Fontainebleau, Parc Disney. The services included are any metro, RER (suburban) train, buses (RATP/Noctilien/Optile), and trams up to the zone limits of your pass. You can buy a Navigo Découverte pass at nearly any Metro, RER, Transilien train ticket window that normally sells tickets and passes. (I say “nearly” because a ticket window may run out of blank Navigo passes to sell you.) You’ll need a smaller than passport size photo to be used on the pass (exact Navigo Decouverte photo size is 3cm tall by 2.5cm wide), plus a pen to write your name. There’s nearly always a photo booth nearby ticket windows at major stations, costing for a set of four pictures, so be sure to get your photo taken before going to the ticket window where they’ll likely have scissors handy for trimming your freshly minted photo on the pass. If you’re hesitant in how to ask to buy the pass at a ticket window, try printing out this page and showing the ticket seller the image of the Découverte card on the top right while holding up your small headshot photo. I’m pretty sure the ticket seller will get the idea. The downside of the pass is its timing. The pass validity starts on Monday morning, first service (usually around 05:30) and ends the following Sunday at last service (metro trains usually arrive at their terminus station around 01:40). If you happen to be arriving mid-week, it may not make financial sense to purchase the pass. After Wednesday midnight, you cannot add zones to the pass for the current week. From Friday onwards you can only purchase zones for the following week. If you plan on arriving Thursday – Sunday, consider buying a carnet of single-use Paris transit tickets (book of ten or twenty) that are good for the entire Paris Metro system and any trains/trams/buses in zone 1, or day passes called Ticket Mobilis. Another option is to buy a Paris Visite card, which is really just a more expensive Mobilis ticket that can be used for a set period of days, starting from whenever you first place the ticket into a turnstile machine. The Paris Visite cards are good for 1, 2, 3 or 5 days and for either zones 1 to 3 or all five zones. Who can buy a Passe Navigo Découverte? Some travelers to Paris have been getting hassled by RATP staff into buying a Carte Paris Visite by refusing to sell them a Passe Navigo Découverte. Please don’t let this happen to you. 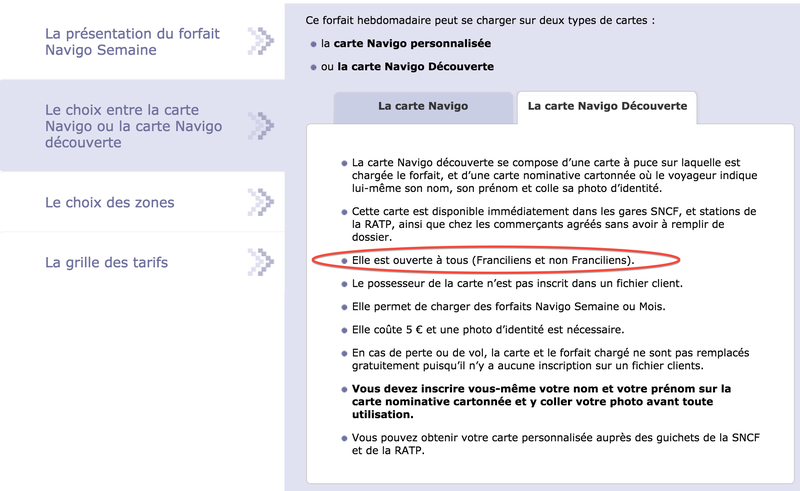 You have the right to purchase a Passe Navigo Découverte as outlined in the official website page entitled Les Forfaits Navigo (Navigo Passes), published by STIF (updated January 2014), the parent organization of RATP (Paris Transit Authority). The section of interest is under the section Le Choix entre la Carte Navigo ou la Carte Navigo découverte, then click on the tab for La carte Navigo Découverte. The line that reads Elle est ouverte à tous (Franciliens et non Franciliens) says that “the card is open to all, residents of Ile-de-France or not”. The old documentation below is kept for posterity. 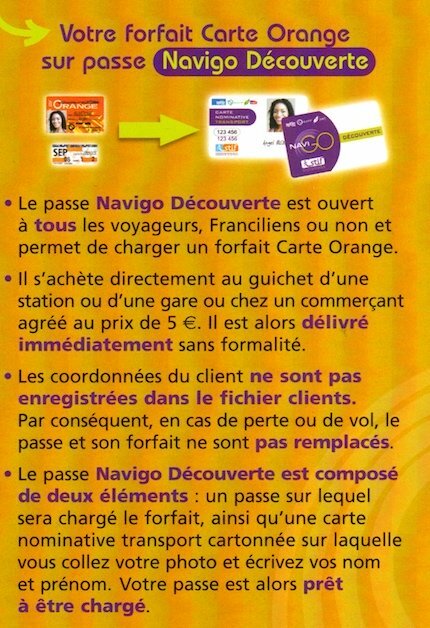 The pass Navigo Découverte is open to all travelers, residents of Ile-de-France or not, and are allowed to load onto it a Carte Orange subscription. It’s purchaseable directly from ticket windows from a [Metro/RER] station or a train station or an authorized resellers at a price of . It is then issued immediately without formality. 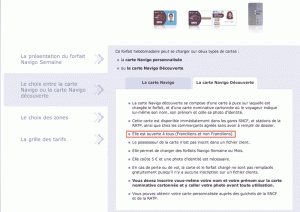 If you are concerned about hassles with purchasing a Passe Navigo Découverte when in Paris and don’t wish to be forced into buying a more expensive Carte Paris Visite, print out this page of Guide Navigo (with the Navigo Découverte tab visible) and bring it with you to Paris. If a ticket seller tells you the Passe Navigo is only for residents, show the guide to the ticket seller. Below is a screen shot of the important text.